The battle between man and machine officially begins in the gritty action epic TERMINATOR SALVATION, blasting its way onto Blu-ray and DVD on 23rd November 2009 in the UK, courtesy of Sony Pictures Home Entertainment. This action-packed prequel to the hit Terminator franchise stars international superstar Christian Bale (Batman Begins, The Dark Knight) as John Connor, leader of the human resistance in a post-Judgment Day world ravaged by deadly Terminators. After engaging audiences around the globe with its intense action sequences, revolutionary special effects, exciting new Terminators, and compelling story of mankind’s battle for survival, TERMINATOR SALVATION is set to thrill on Blu-ray and DVD. The Blu-ray edition of TERMINATOR SALVATION features crystal clear picture, earth rattling sound and is packed with spectacular bonus features, including two behind the scenes featurettes, “Re-Forging the Future,” an exclusive look at the film’s production and “The Moto-Terminator,” a featurette revealing how the film’s visual effects crew and motorcycle manufacturer Ducati partnered to create the slick and deadly Moto-Terminators. Also included on the Blu-ray release, Maximum Movie Mode, which allows viewers to see McG deconstructing key moments from the film, Picture In Picture (PiP) commentary with cast and crew interviews, storyboards, still galleries and timeline, plus eleven mini featurette focus points spotlighting how the ground-breaking special effects were created. BD-Live features on the disc include: “Resist or be Terminated” Tech Com videos, featuring nine viral videos documenting the resistance campaign up to the theatrical release, plus four new videos and “The Final Resistance” video, in which viewers can access the secret plans of Skynet. CINECHAT enables movie fans chat live with friends around the world while viewing this, or any other CINECHAT-enabled Sony BD title. 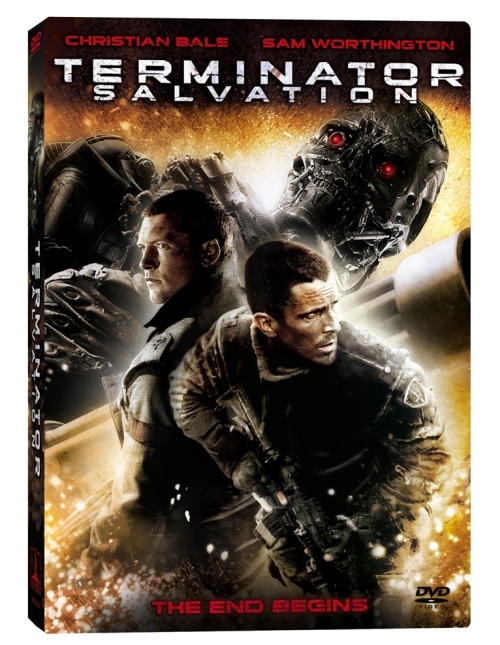 Priced to own at an RRP of £24.99 (Blu-ray) and £19.99 (DVD), TERMINATOR SALVATION is the beginning of an exciting new chapter in the mega hit Terminator series movie lovers around the world won’t want to miss. TERMINATOR SALVATION was directed by acclaimed director McG (Charlie’s Angels 1 & 2). Joining Christian Bale in the visually breathtaking fight to save the human race is an all-star cast that includes Australian newcomer Sam Worthington (James Cameron’s Avatar), who was cast in the critical role of “Marcus Wright” after a personal recommendation from James Cameron, Bryce Dallas Howard (The Village), famed American hip-hop star Common (Wanted), rising young star Anton Yelchin (Star Trek) and Helena Bonham Carter (Harry Potter). TERMINATOR SALVATION was produced by Moritz Borman (Terminator 3: Rise of the Machines), Derek Anderson (After the Wedding), Victor Kubicek (After the Wedding) and Jeffrey Silver (300). It was co-written by the writing team of John D. Brancato and Michael Ferris (Terminator 3: Rise of the Machines, The Game). The film also co-stars Jane Alexander (The Ring), Moon Bloodgood (What Just Happened?) and Michael Ironside (Total Recall). The film was released internationally by Sony Pictures Releasing with a run time of approximately 114 minutes and has an expected rating of 12 (tbc) on DVD and Blu-ray. John Connor (Bale) was fated to lead the human resistance against Skynet and its army of Terminators. But the future Connor was raised to believe in is altered in part by the appearance of Marcus Wright (Worthington), a stranger whose last memory is of being on death row. Connor must decide whether Marcus has been sent from the future, or rescued from the past. As Skynet prepares its final onslaught, Connor and Marcus both embark on an odyssey that takes them into the heart of Skynet’s operations, where they uncover the terrible secret behind the possible annihilation of mankind. “Re-Forging the Future” – Go behind the scenes of Terminator Salvation with an exclusive set tour. “The Moto-Terminator” – See how the Terminator Salvation visual effects crew and Ducati partnered to create the slick and deadly Moto-Terminator! Maximum Movie Mode featuring director McG deconstructing the film’s key moments. Picture (PiP) commentary with cast and crew interviews, storyboards, still galleries, timeline and more! Plus, 11 mini featurette focus points spotlighting how the ground-breaking special effects were created! CINECHAT – BD-Live technology that lets viewers around the world chat live about this, or any other CINECHAT enabled BD disc, from Sony Pictures International Home Entertainment! The Blu-ray Disc™ version of TERMINATOR SALVATION is BD-Live™ enabled, allowing users to get connected and go beyond the disc via an Internet-connected Blu-ray player. Download content, give feedback through an exclusive survey, and register for rewards. Sony Pictures Home Entertainment is a Sony Pictures Entertainment company. SPE is a division of Sony Corporation of America, a subsidiary of Tokyo-based Sony Corporation. SPE’s global operations encompass motion picture production and distribution; television production and distribution; digital content creation and distribution; worldwide channel investments; home entertainment acquisition and distribution; operation of studio facilities; development of new entertainment products, services and technologies; and distribution of filmed entertainment in more than 100 countries. Sony Pictures Entertainment can be found on the World Wide Web at http://www.sonypictures.com. For more info on Blu-ray Disc™, visit www.sonypictures.com/bluray.